I had forgotten, of course, that I had all of the love (a word I probably use too loosely) I could ever ask for in the form of a mute-flightless-six foot tall-uncanny bird who will accept me no matter who I am. I’d have swiped right on this one. This one I’d look through the profile and then swipe left. Swoon right? And if you are someone who needs more than just the physical attributes of a giant bird (and that amazing beak) Herky has many other amazing qualities. Herky is a life-long feminist, as the University of Iowa was the first institution to admit men and woman on an equal basis in 1860. He is sensitive and caring while still having fun and playing around with anyone who wants a picture. I have never seen him with a different expression, proving that no matter the issue, he can remain composed. You want someone who is mature and older? Well Herky first appeared in a football game in 1959. Assume birds age at a different rate than people, he is at least 30 years old. You want someone who always dresses nicely? 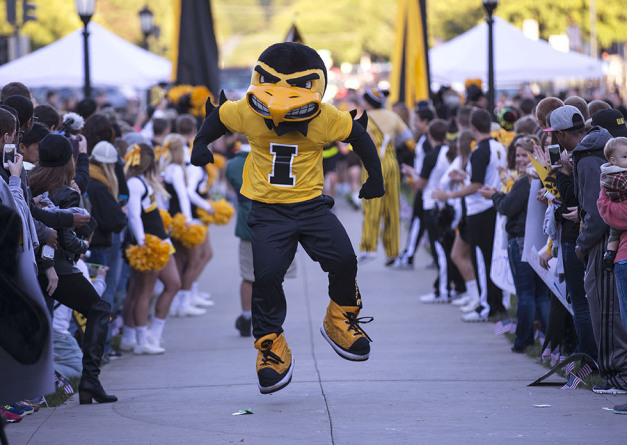 Well Herky is always wearing black and gold, and everyone looks good in black and gold. You want someone who can help you through disappointing times? Well, as the mascot for the Hawkeyes, he has seen his share. In addition, most birds just want to make their nests and fly around (I know literally nothing about birds besides that they have beaks and wings, don’t quote me), but he can be your bird of a feather. You like sports? So does Herky. You like music? So does Herky. You like sitting on a couch and watching movies? So does Herky. You like having deep, intense conversations? So does..we can’t all be perfect. But, since he can’t talk, he is a great listener. 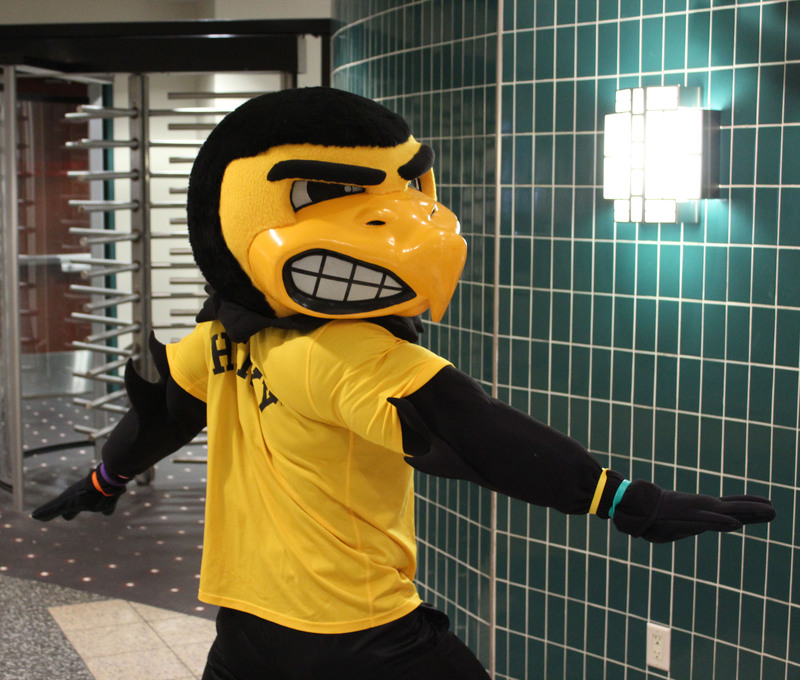 Herky will also push you to be the best you can be. I like to think of who I was four years ago before I met him on that warm summer orientation day (2013 B.H). Without Herky in my life, I wouldn’t have grown in the way I never knew I needed to. I was admittedly a negative, habitually depressed, self-centered narcissistic. Now, I’m slightly less of all of those things. Through his guidance, I found a group of people who affirmed me and turned me into a way more positive person who is really enjoying the life I am living. I have found a passion for my various first year initiatives like Orientation and On Iowa. Herky is at all of those, supporting everyone. Who needs a date when this Hawkeye has caught your eye? However, in all seriousness, I don’t wish to downplay the emotions that are prevalent to the love-struck without someone on Valentine’s day. So if you do feel alone I say this; even if someone hasn’t told you they love you today, you are loved, by more than just a tall-drink-of-water bird. And I can promise you that you aren’t the only one watching a romantic comedy wondering if that could be you. Your future other half might be doing the exact same thing. Heck, I’ll be doing the same thing. The beauty of your time here is that anyone can impact and change your life every day in more ways than just romance. Being around Herky gives you the opportunity engage is thousands of different perspectives and expose you to the people that you plan to cherish for the rest of your life, not just one day. If today can’t be celebrated in the way Hallmark intends, then celebrate with the people in your life who you care about and care about you. If Valentine’s Day is supposed to be a celebration of love, who says that is exclusively between couples. And if no one has told you they love you today, I love you. Chocolates go on sale February 15th.